Passive 3D from the beginning – Part 4 – So how does LG work now? 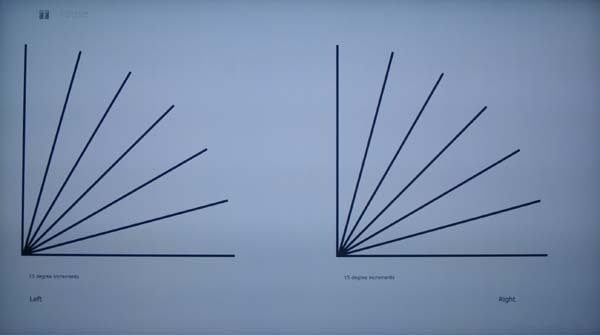 So far we’ve established that at least at one point last year Toshiba and LG passive 3D TVs worked by eliminating all the even lines from both eye views, and showing you only the odd numbered lines, shifting the right-hand lines down by one. Before the Cinema 3D technology worked like this: During a time period of 1/200 seconds the TV showed 2 frames; 540 lines for the left eye and 540 lines for the right eye. The new algorithm shows 4 frames instead of 2 during the 1/200 second time frame. It shows 1080i for the left eye and 1080i for the right eye. 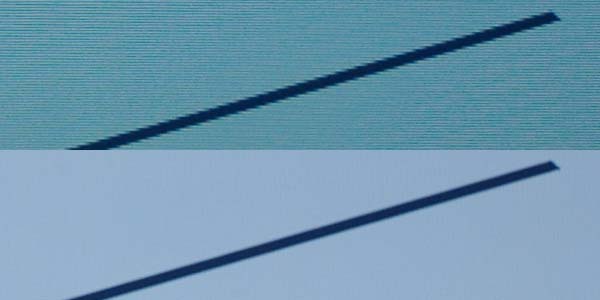 When these are combined the two pictures create a 1080p picture according to LG. LG believes that this update improves picture quality on their Cinema 3D TVs to compete directly with the active 3D TVs such as 3D plasma TVs. You need to turn off TruMotion to utilize the new algorithm. See the illustration below. I felt that I had pretty much confirmed this using special test patterns that I created with different colours on each line. I also felt I had established fairly well that this would still result in jaggies. To put it in the terms I’ve been using these last few posts, LG had shifted to a Both Line Allocation system. The diagonals on the left and right halves of this are identical and if the screen is cut in half and one laid over the other, they are a pixel-perfect match. All that is to allow them to be displayed using the side-by-side 3D method. The side-by-side 3D mode cuts the picture into equal left and right halves, doubles the horizontal width of each of them and allocates them to the left and right eyes. Since no 3D glasses were in use, what we see here are both eye views at the same time. Ignore the colour differences. The polarisation does strange things. In the top half — viewed through just one lens of the glasses — we see the expected jaggies of course. Remember, with this view half the lines are missing. But in the bottom half, there are no jaggies. It is clear that every single pixel is present. Alternate Line Allocation: With this the display throws out L2, L4 … L1080, and also throws out R1, R3 … R1079. Thus there is no shifting. 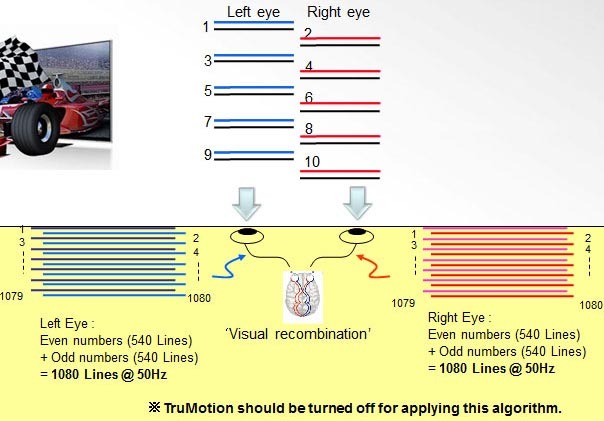 With your left eye you see only odd numbered lines in their correct placement on the odd numbered display lines. Likewise with your right eye you see only even numbered lines, correctly placed on their even numbered display lines. So all lines that you see are in their correct places on the display. But, of course, half the lines are missing. The reason you don’t see jaggies is because the odd display lines are getting their content from the odd source lines, the even display lines are getting their stuff from the even source lines, and even lines in both eye views are identical to each other, as are the odd lines. So we have one set of test patterns suggesting Both Line Allocation and one suggesting Alternate Line Allocation. Same TV (LG 55LM9600), most recent firmware (Ver.03.01.05), apparently different modes of operation. Which, of course, leaves me puzzled. 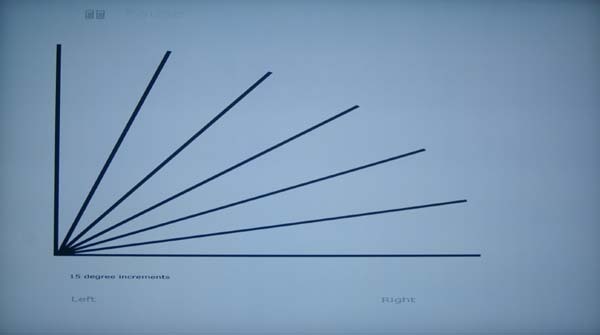 Does the TV analyse the content and apply different strategies depending on what the content is? That’s the only thing I can think of which would explain this inconsistent behaviour. Perhaps it looks for hard edges aligned between the two eye views and slips onto Alternate Line Allocation based on that? For now, I shall just invite comment from those who know far more about this stuff than me. 4 Responses to Passive 3D from the beginning – Part 4 – So how does LG work now? Even from this I still don’t clearly understand what Lg are doing are they attempting to heal the resolution loss by packing it temporally and displaying twice as many frames in total ? Of course alloy of 3d content is in 720p so do this res thing get even worse again ? Passive is the way forward just a pity they couldn’t have dele oped the double v res panels first, where the tv double heights standard content before sending it to the panel, or sends the full v res of both frames at a time to the tv at a double pace ? Then weirdly isnt the horizontal res affected by this method ? Someone’s to make the definitive test to see what’s going on and how to to test it ? Perhaps make your arc lines different colours and see how the stripe colours come out or not ? So, does that mean that alternate lines are oppositely polarized?